Smoked turkey sausage is a popular protein with all of the members of my family. Where my husband is concerned, all I have to do is mention the words sausage and peppers in the same sentence and he's sold. The texture is similar to a hot dog, which makes it an instant win with my daughter. I like turkey sausage because it's better for you than beef sausage, but still has a nice smokey robust flavor. For these sandwiches I've taken the idea of a sausage, pepper and onion hero and put an italian spin on it. They're a little messy, but my favorite part about eating them is sopping up all of the juices and bits of onions and peppers that escape with the last few bites of my crusty roll. Get the napkins ready, you'll need them! *Amendment: One thing I love about cooking for my family is leftovers. I will usually finish off whatever is left over from the previous night's dinner for lunch the following day. That's exactly what I planned on doing with this recipe when I wrapped it up and stuck it in the fridge last night. That is until I started thinking about the fact that it's already warmed up to the mid 80's here in the sunshine state. Translation: I'm going to have to pull out the dreaded bathing suit soon. So, in proper bathing suit preparation fashion, I decided to have my leftovers sans the bun. I heated up the sandwich filling and ate it from a bowl with a little fresh grated pecorino romano cheese sprinkled on top. It was delish! If you're watching the carbs, skip the bun and skip the guilt! Heat the olive oil in a large frying pan of medium heat. Add sliced turkey sausage and fry until browned, about 5 minutes. Remove the sausage from the pan with a slotted spoon. Add the peppers, onions, garlic, salt, pepper, basil and oregano to the pan and cook until the peppers and onions are soft, about 7 minutes. Add the tomatoes and sausage to the pan and simmer uncovered for about 10 minutes, stirring frequently. Hollow out some of the bottom bun being careful not to break through the bottom. Spoon sausage mixture into the buns. 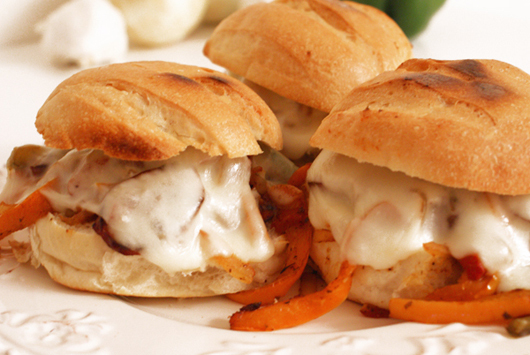 Top each sandwich with 1 slice of mozzarella cheese. Place sandwiches open faced on a cookie sheet. Bake in preheated oven until the cheese is melted, about 5 minutes. 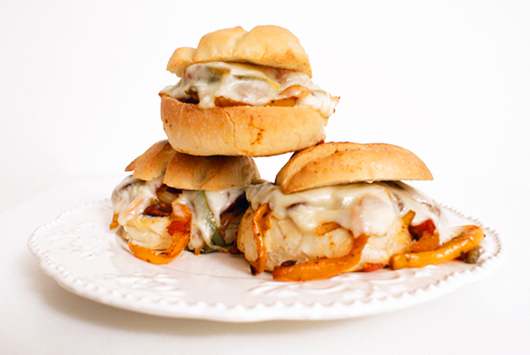 Remove from oven, place top buns on sandwiches and serve immediately. LOVE, LOVE, LOVE this one. Mmmmm... and so glad leftovers can actually be "on plan" the next day!